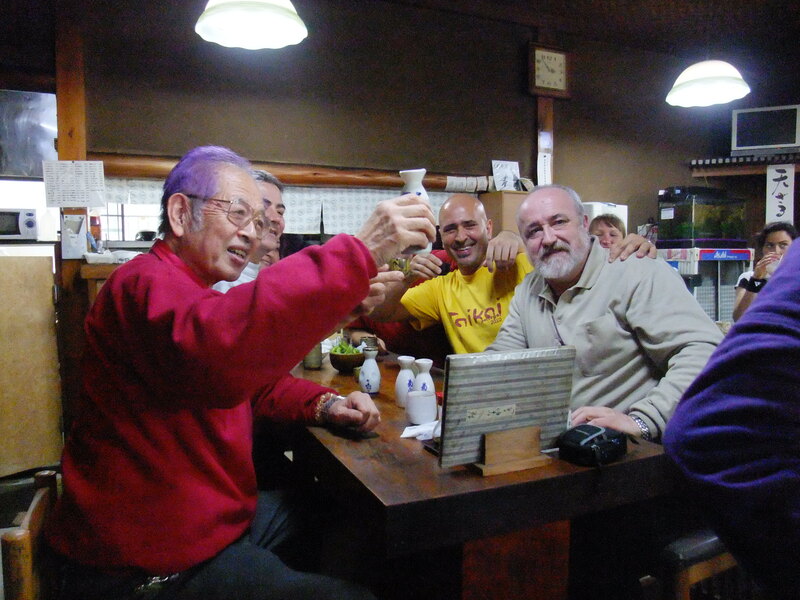 Daikomyo Sai apart from being sensei’s birthday is always a very particular moment in the life of the bujinkan. 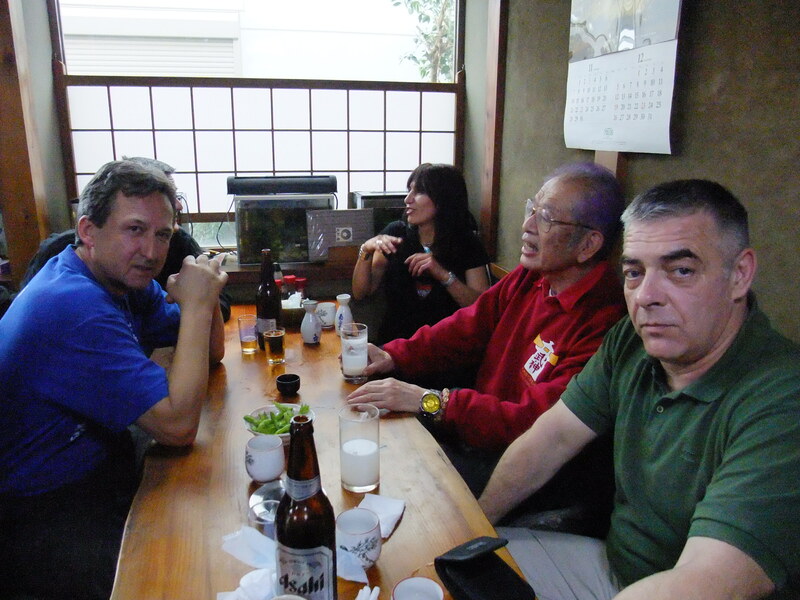 People from all over the world gather here in Noda and Tokyo for this occasion and this year more than ever. I spoke with some residents who told me that they were expecting between 300 and 400 participants this year! Friday night we were almost 200 in the Honbu and 230 on Sunday! This moment is also special as sensei concludes the theme of the year and introduces the new theme for the next year. 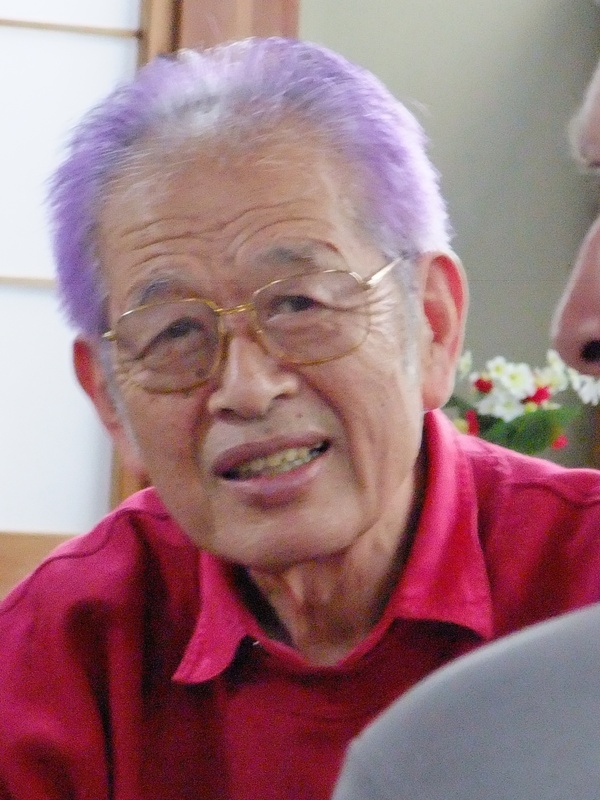 On Friday he told us that “kihon happô” will be the theme for 2011 and added: “same sounds but not same writing…”. 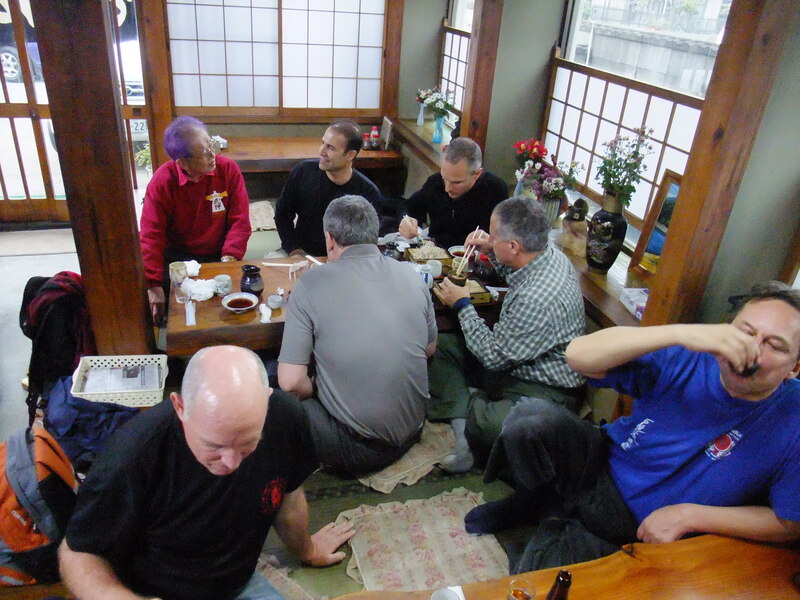 As sensei invited a few of us for lunch on Sunday, I took this opportunity to ask him about the meaning of this new “kihon happô”. 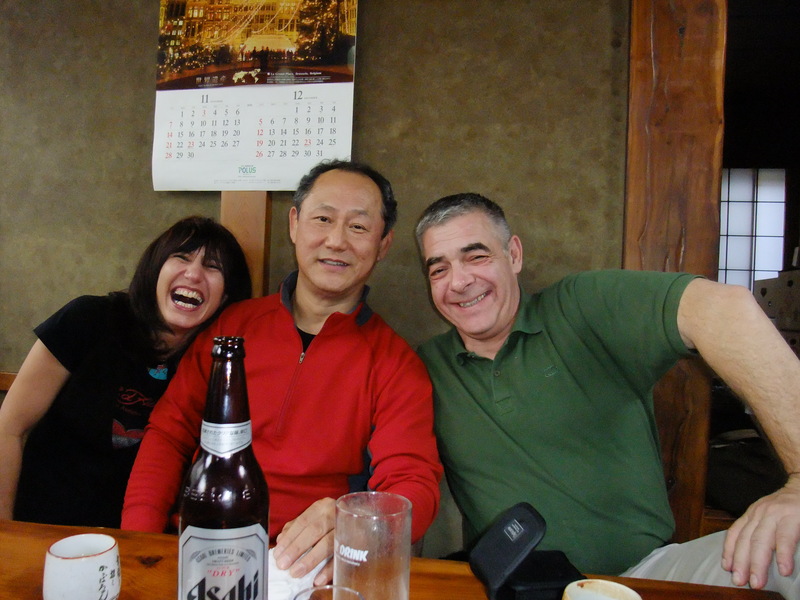 Hatsumi sensei said that “ki” was “season” and “hon” was “reverse”. He didn’t explain about “happô” but I will give you my interpretation. Before that I would like to share with you a few concepts he detailed last week during the previous classes.. Tuesday he demonstrated a few techniques where instead of hitting uke he would hit the space on the side of uke creating a moment of total fear in his opponent and opening endless possibilities of action. He said that we should “hit the kukan” to influence uke’s reactions. On Friday he defined our movements as being “chûto hanpa” or “half way half finished”. To illustrate this he spoke again of the goshin (ken, tachi, juo, katana, modern weapons). Modern weapons were compared by him to “robots”. Your actions cannot influence a computer or a machine following a program. And if you train budô in a “robotic” way your actions can be interpreted and deciphered by your opponents. On the opposite if your budô is artistic and does not follow a “beginning-end”; if your techniques are not finished then the opponent is not able to counter your actions. In the fight, he added, you have to feel the “fun iki” i.e. “the atmosphere, the ambiance” of the situation and to move accordingly. All the information you need is available to you if you have no intention of doing anything in particular. Your movements are natural ( i.e. not created) and participate of the feeling you get from the situation at hand. Our footwork is the key to adapt our movements to the situation. Hatsumi sensei said that until recently he didn’t understand why Takamatsu sensei had taught him the “josei no goshin jutsu” (woman self defense). With the small footwork of a woman trapped by the limited amplitude of her kimono (traditional kimono are very narrow at the legs) you can, with tiny movements of your feet, take the balance of the opponent in close-combat (remember that we were around 200 in the dôjô that night and that moving was difficult). In a situation like that using “josei no goshin jutsu” is the only solution. Instead of doing a technique we move in an artistic manner invisible to uke’s analysis. In the name “martial art” this is where the “art” is to be found. Art is not about applying a technique. This is not the answer. Sensei added that the new mission of the jûgodan was to transform their mechanical robotic budô movements into artistic ones. Through Art one can feel the atmosphere and respond with natural and unfinished movements. This vision of taijutsu was repeated on Sunday when he insisted on the flow of our movements coming from the feet: “Nagare comes from the legs” he said. In fact uke thinks and then acts (ten-chi process) and tori should do the exact opposite (chi-ten process). It reminds me of Dr. Paul Watlawicz explaining that action should always precede reflection in human relations, and fighting is part of human relations. Too bad for Descartes and his “cogito ergo sum!”. How come all of the above can be linked with the kihon happô of 2011? When sensei spoke of kihon on Sunday during our lunch and said that “kihon” is “season reverse” he didn’t explain the new meaning of happô. When you look in a dictionary happô (hachi hô) has many meanings. My interpretation (possibly wrong) is that hachi is the recipient (bowl, basin), a little similar to the “ki, utsuwa” of 2009 (sainô konki) and “hô” is information. Happô becomes the recipient of all the possible information of a situation. As we understood it in the sainô konki year, the bigger the utsuwa, the bigger the kûkan. Therefore if “kihon” is the beginning of a new cycle (season reverse) and “happô” as the sum of information in the kûkan, then the “kihon happô” of 2011 could be interpreted as follow: By feeling the atmosphere (fun iki) of the situation i.e. reading the information of our environment (happô) we can change the cycle of action (kihon) and turn it to our own advantage by reacting without any preconceived ideas to the definite actions of uke. Moving softly with the “josei no goshin jutsu” attitude, uke has no possibility to read our actions because we do not know ourselves what we are going to do next. Each one of our movements having no end we only do things half-way, “chûto”, and never finish them, “hanpa”. Hitting the kûkan will send false information to uke and gives the ability to overcome his intentions. Previous Post Disciple or Technician? Thanks again for this – food for thoughts indeed ! I was just wondering – although this may of course be a bit far-fetched – if this ‘reverse season’ notion recently introduced could be linked with the controversially announced pole-shift. Hello Arnaud, thanks to share, one more time, your interpretation with us, it’s always a light in the darkness (daikomyo ?) for me. Thank you that was an excellent post. 2011 sounds like it will be a very exciting year. I think the josei no goshin jutsu is a wonderful view point for the Kihon Happo! Erasing all useless movements to create an even more natural way of moving, or training “our” (as in personal) Kihon. This concept kind of reminds me of interpreting Sanshin no kata with Shinden Fudo Ryu natural moving, witch you showed us a few years ago. Gambatte ne! Also keep up the good work, lots of respect! Thank you for very interesting information. It made me think of danish author who has been writing about science in an every day language. His name is Tor Noerretranders and his book from 1991 ” Feel the World – an account on conscience ” has some chapters that talks about the human perception..
if Michael Laudrup ( world famous footballplayer at the time) should think about every move he makes in the field , he would be no good as a player at all. In all Art like in sculpting Statues chip away and refine! Thanks for the info. It has given a good insight and inspiration. Hey Arnaud, thanks for the post – it’s refreshing to read your insights. Would you, or anyone reading this, be kind enough to show the kanji composition for this year’s theme? It may aid my understanding. Thanks again – keep up the good works. Muchas gracias por compartir tu visión del budo del soke con todos nosotros!